Sub: Entitlement of various types of accommodation based on the revised pay scale recommended by the 7th Central Pay Commission. This is in reference to SER’s letter quoted above. 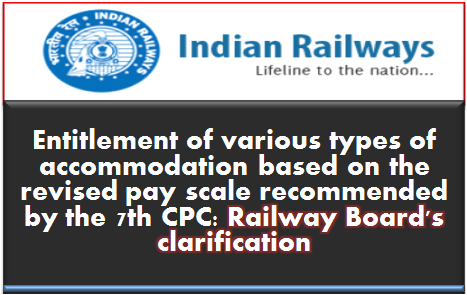 It is advised that the level of pay scale recommended by the 7th CPC are corresponding to grade pay, as such the instruction issued vide Board’s letter under reference still holds good. It is further advised that there has been no change in the entitlement of the railway employees for Railway accommodation. Eligibility of entitlement and eligibility to register for the waiting list of a particular type of quarter are two different issues, should be dealt with separately. No change in the entitlement of the railway employees for Railway accommodation. Eligibility of entitlement and eligibility to register for the waiting list of a particular type of quarter are two different issues, should be dealt with separately.